With a careful study of the work of each of the indicators, one can understand when it is possible to conclude a deal, and when it is necessary to leave the market and wait for the flat. ll the indicators presented in the system are unique in their own way and can work independently. But the combination of this composition of indicators certainly increases the chances of the trader to the maximum and the ability to constantly be in profit is for every owner of this system. Hence the name "System of Perfect Profit"
Of course, the visibility of the market, the understanding of indicator signals, discipline (the most important factor of a trader's luck) is different for everyone, but with a clear performance of all indicator indicators at the same time you will never lose using this system. The first thing you need to decide for how long we will open positions? If it is trading within a day, then first I go to TF N4 and watch the direction of the trend. If there is a bullish trend, then I turn to TF M15 and look for entry to the market only for purchase! I ignore all the signals for sale. I can not wait for the signal during the day, but I did not lose a single pip with exact certainty. Tomorrow will be a new day and, accordingly, new trends! Finally, I get a buy signal from a couple of indicators. There is no need to hurry. You need to make sure that the candle or price has closed above the line of the monaeline, the waves of chaos have long been drawn, the indicator "Bull's eye" is already green, the TF from M15 to N4 is up, that's where I'll go to buy on the trend, with this MUST! Putting a stop on the last extremum. 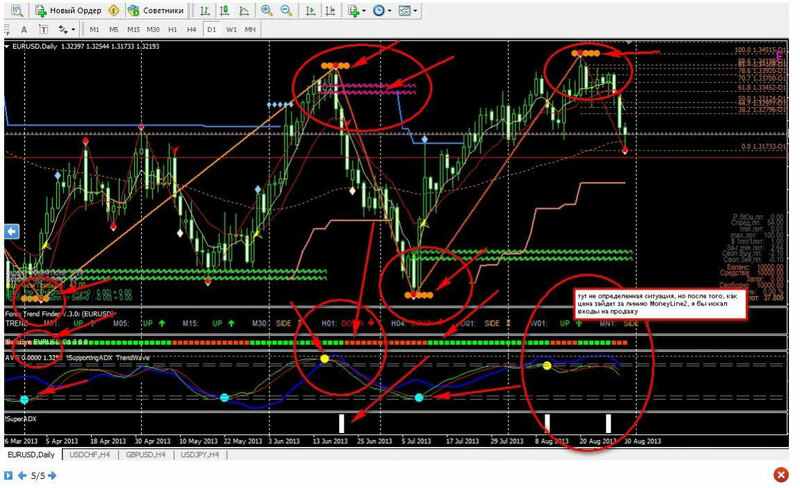 Let even for example the "TrendWall" indicator did not give a signal, and "ForexTrend" did not say anything, but they can give an excellent signal to exit the deal. Having got my legitimate pips I turn off the terminal and do my own thing. The mistake of beginning traders is also the fact that they want to take everything from the market and earn millions in a month, but this does not happen. It is natural for a person to rest, but to sit for weeks at a monitor and receive information from the brain that is not rested, too, the reason for the wrong (hasty) actions of the trader. Hence the discharge of the deposit. Actions for sell are exactly the opposite. Check the direction of the senior TF, wait for the signal on M15 and in front of the profit! On all other TFs, the work is the same. First, study the older, then work on the younger, but always on the trend and with a stop. I do not advise on this system to work for M1 and M5 - this is too risky for you. I wish you good luck and profit! In the pictures SBP V.3 System in action.